Kontron has expanded its TRACe family of operational computers designed specifically for the railway market. The Kontron TRACe-B40x-TR, an EN50155 certified fanless generic platform, features the latest Intel Atom E3900 series processors and 6th Generation Intel Core processors. The first released variant is the Kontron TRACe-B404-TR, based on the Intel Atom x5-E3940 quad-core at 1.6 GHz high performance per watt processor, with 8 GB DDR3L memory and 32 GB SLC eMMC Flash. Other variants will be made available later, based on Intel Atom x7-E3950 quad-core at 1.6 GHz, Intel Core i3-6100U, or Intel Core i7-6600U processors when higher performance is needed. Kontron TRACe-B40x-TR has two independent networks (2x LAN with M12 connectors). It comes with an ultra-wide range power supply (from 24 VDC to 110 VDC nominal input voltage range, including tolerance range of +/- 40% required according to EN 50155, meaning a voltage range between 144 VDC and 154 VDC) adapted to all types of railway vehicles from light rail vehicles to high speed trains. The front plate operational connectors are electrically insulated in compliance to EN50155 standard with lockable M12 connectors. The rear plate hosts standard connectors (display port, USB 3.0/2.0, serial line) for maintenance purposes and is protected from dust and water during operations with a cover plate. 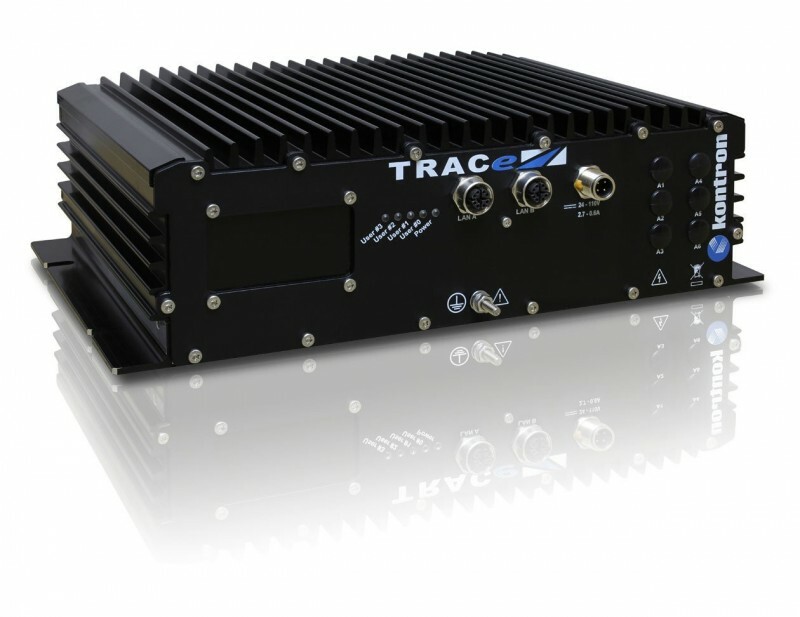 Thanks to its modularity, the TRACe-B40x-TR product also accommodates several optional wireless interfaces (such as Wi-Fi, 4G/LTE, and GNSS), field busses (RS422/485, CAN, MVB, and others), SATA devices (up to two 2.5’-inch SSD) and/or additional optional I/Os (such as DIOs, Audio, and USB) to match any railway applications such as on-board CCTV, entertainment/infotainment PIS or TCMS. Samples of the Kontron TRACe B404-TR are available now. MEN Micro has announced the BC50R, a maintenance-free box computer that has been designed for data acquisition applications in rugged environments in vehicles such as trains, commercial vehicles, mobile machines or ships. All interfaces are implemented on rugged M12 connectors (USB, digital input and output, Gigabit Ethernet, CAN and legacy serial I/O). The housing is compliant to the IP65 protection class. On the inside, the system offers two PCI Express Mini card slots with two SIM card slots for WLAN, GNSS or 3G/4G functionality. The necessary antenna connectors can be made available at the front panel. It is powered by an AMD Embedded G-Series APU (Accelerated Processing Unit), the T48N, running at 1.4 GHz. The use of the Embedded G-Series makes for high scalability in CPU (single/dual core) performance. The BC50R is equipped with 2 GB of DDR3 SDRAM and offers SD card and mSATA slots. The system is designed for fanless operation at temperatures from -40 to +70°C (+85°C for up to 10 minutes), its special aluminum housing with cooling fins serves as a heat sink for the internal electronics and in this way provides conduction cooling. The BC50R supports a 24 VDC and 36 VDC nom. class S2 power supply in compliance with EN 50155 or power supplies which comply with ISO 7637-2 (E-mark for automotive) (nominal input voltage 24 V) or with EN 60945 (ship). The power can be switched on and off using an ignition signal on the power connector, and a shutdown-delay time after switching off the power can be adjusted by software. The combination of the various CPU/GPU options with the available selection of external interfaces (realized via separate graphics and I/O interface boards within the system) makes for an flexible system design that can quickly be tailored to a wide variety of applications.